This premium quality keepsake box displays photo and text with hand-painted silver accents. Store photos and special items such as toys and trinkets in the keepsake box to treasure forever. Perfect for the baby's room or for grandparents to keep photos of the baby. Made of high quality rosewood with a premium piano finish. The rosewood is finely sanded multiple times, stained and finished with several coats of varnish - the same type of finishing used for grand pianos. 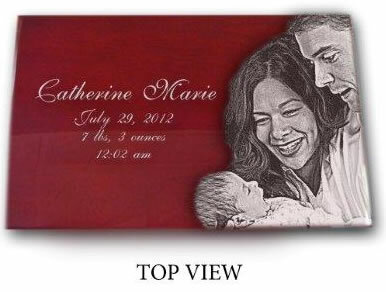 The fine piano finish allows for a beautiful engraving of your photograph, names, dates and message. 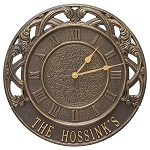 The engraving is hand painted with silver for accent. 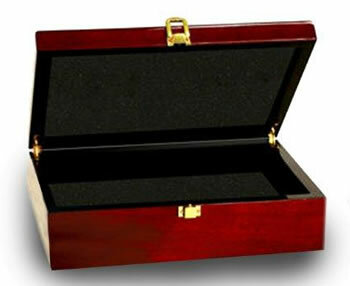 The box is lined with black velvet and has brass hinges and latch. Dimensions: 7 3/4" x 6 1/4" x 2 3/8"
Dimensions: 10 1/4" x 7 1/4" x 3"
Dimensions: 12 1/4" x 8 1/4" x 3 1/2"